Yup, it's our favorite. Everybody loves finding stuff for free. Especially when it's so close to your house that you don't have to schlep it huge distances, or tie it to the roof of your car with odd sizes of bungee cords that you've tied together in a very haphazard fashion, hoping that you're not stopped by the police and have to explain why you have this thing sort of attached to your roof but dangling precariously down one side because the day they taught rope tying at Scouts, you were hanging out smoking with the cool kids. Another merit badge you didn't get. 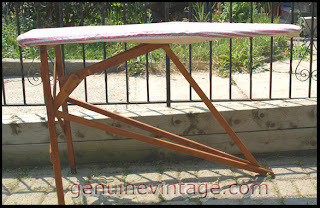 Today's curbside find is an old wooden ironing board. In really good shape, too. If I wasn't already using one (with another in reserve, for when that one goes), I'd keep it. 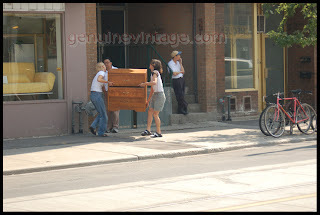 Good thing I have warehouse space where we keep the stuff we rent out to photographers and the movies (torontoprops.com). Too bad we already have a half dozen sitting around waiting to be rented out. Good thing we'll be at the Sunday Market this Sunday. Guess what we'll have out for sale... really cheap.